I recently visited Denver and had a chance to check out a couple of local fish stores. One of the first stores we visited was Aquamart. Located at 3255 S Wadsworth Blvd, Lakewood Colorado, Aquamart is not just a great local store, but also an educational resource for hobbyists. 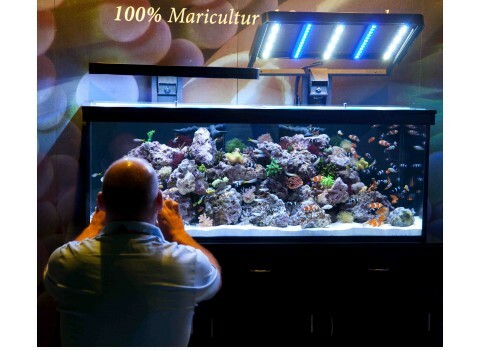 The first thing to get my attention was the 2 210 gallon show tanks, 1 of which is featured in Tony Vargas’ new book “The Coral Reef Aquarium.” The first is a dual island SPS dominated system, displaying a beautiful array of colors, shapes and sizes. To be honest, there were probably only about 30 colonies in there I wanted in my tank. The next tank was a colorful softy and LPS garden. Both tanks were in great condition and absolutely spotless! Next we took a look at the vast selection of aquariums and dry goods. From all in one systems, to supplements, additives, food, lighting, pumps, powerheads, and anything else your saltwater-loving heart may desire, Aquamart had it all. Next we checked out the 2 400 gallon coral runways. Again, these absolutely spotless display runways, were stacked with everything from zoas, palys, LPS, SPS, to clams and anemones. The way the corals were displayed made it really easy to get both a “through the glass” and “top-down” view of each coral. 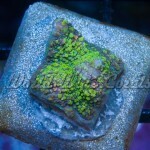 What was particularly nice about the selection at Aquamart, was the fact that they had both frags and large colonies. 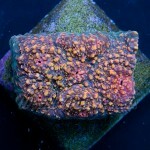 I tried leaving empty-handed, but ended up buying a bubble-tip anemone that showed up while I was there. 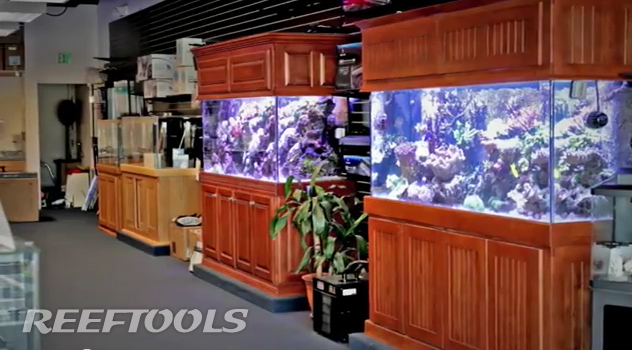 The entire rest of the store is occupied by a 2500 gallon fish and invert system. Tank after tank of healthy livestock, happily swimming around in appropriately-sized habitats. Before any fish is sold, it is first held an inspected in a dedicated 800 gallon quarantine system. This extra level of quality control is helps Aquamart deliver healthy livestock to its clients. Overall, I was impressed with the store, and it will be one that I am sure to visit whenever I am in the Denver area. Please make sure to subscribe to our YouTube Channel. 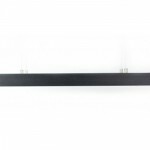 Premium Aquatics: 14K 250watt HQI Double End Halide Bulb – Phoenix. 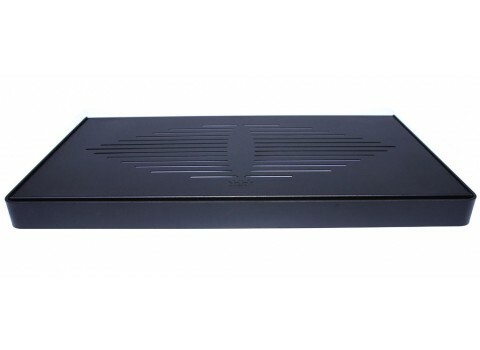 Regular price $64.99, now only $55.99! Salty Critter:20% OFF all ZeoVit additives. 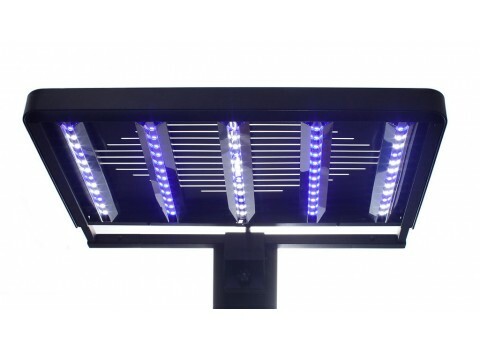 HelloLights: 24 Inch Coralife Lunar Aqualight T5 Lamp High Output Fixture. 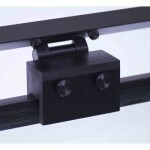 Regular price $205.95, now only $172.95! 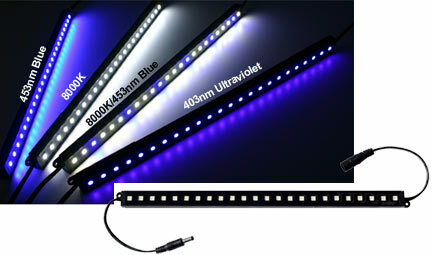 Marine Depot: Orphek PR-25 (12 LEDs) Dimmable LED Pendants. Save $40. That Pet Place: FREE SHIPPING on all orders over $49! 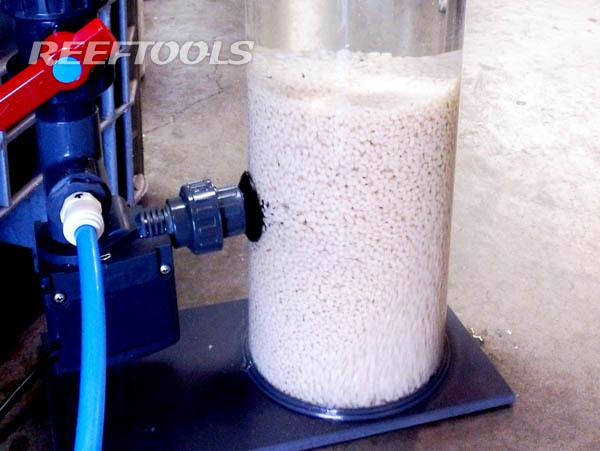 Bulk Reef Supply: 10% OFF Bulk Reef Supply Granular Ferric Oxide. 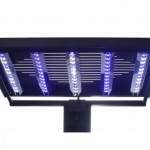 Foster and Smith Aquatics: 10% OFF Ecoxotic Stunner LED Strips. 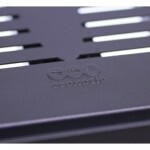 Reef Specialty: ATB HQ Activated Carbon 2 pound. Regular price $15.99, now only $13.99! 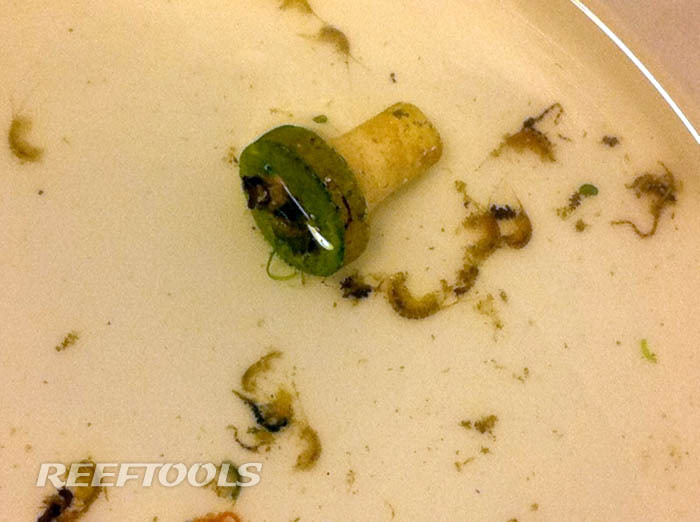 SeaQuest Marine:	Joe’s Juice: Aiptasia & Majano Eliminator. 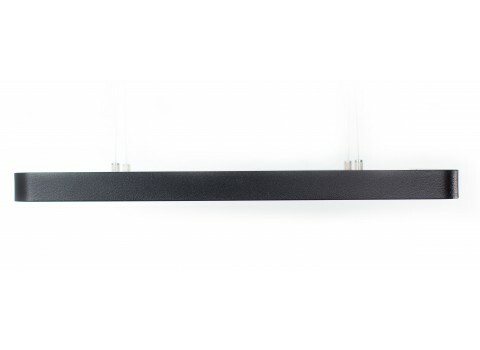 Regular price $9.99, now only $8.88! 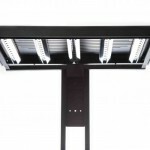 Aquarium Guys: Visi-Therm Deluxe Submersible Heater – 200W. Regular price $20.69, now only $15.99! 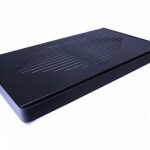 Big Als Online: Jager TruTemp Heater – 250 Watt. Regular price, $32.99, now only $23.99. 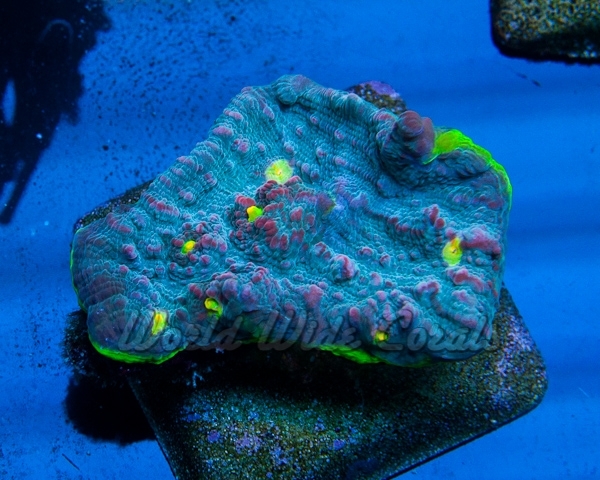 Have you heard of the World Wide Corals Cyber Monday sale? The 24 hour coral marathon was an absolute madhouse. 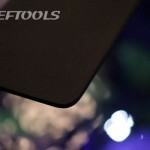 The thread had 4135 posts to it due to discount of up to 70% off. 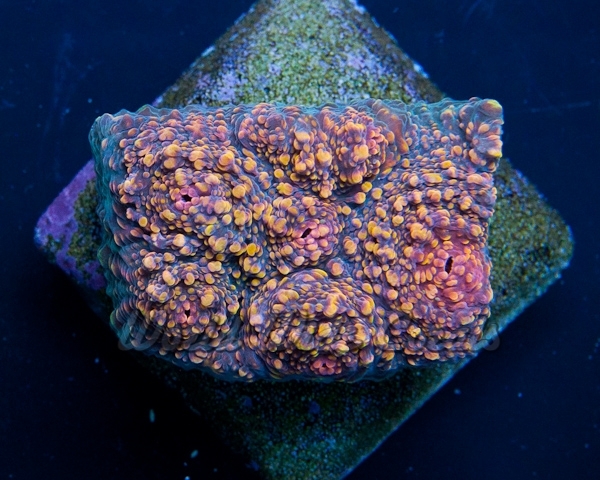 This has got to be one of the craziest coral sales in history, with over a quarter million views… Huge props to the guys over WWC for pulling off this monumental effort. 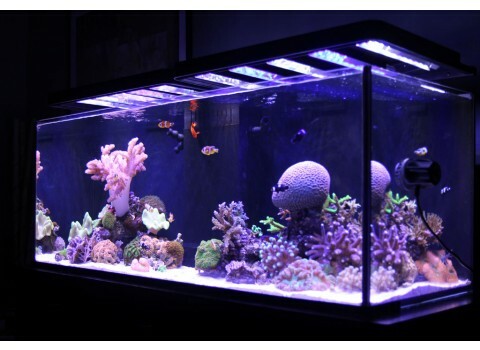 Have you ever sat back and thought about how much time, work and money you have put into your reef tank? 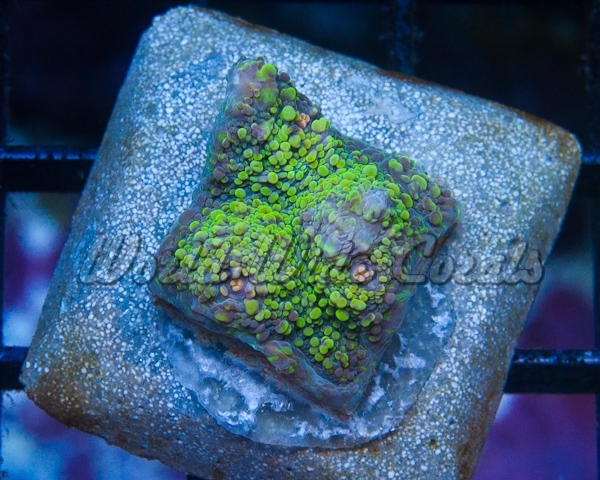 How much have you spent on corals? Go ahead think about it…. 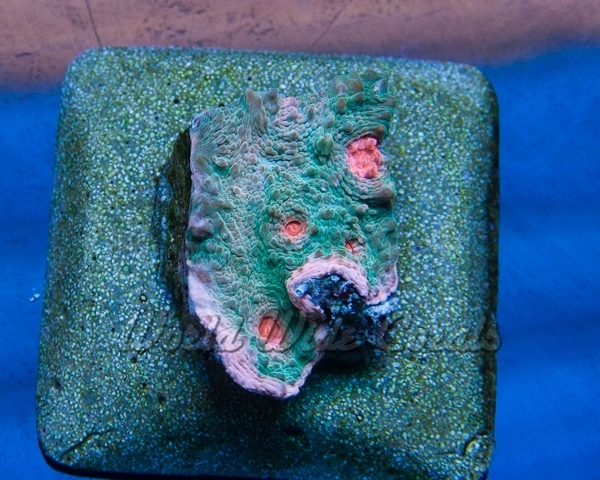 Now that you have an idea of where you are in the hobby, imagine picking up a few new corals. After acclimating them and introducing it into your system, you now have a new family of monti eating nudis, some AEFW, zoa eating nudis, etc…. 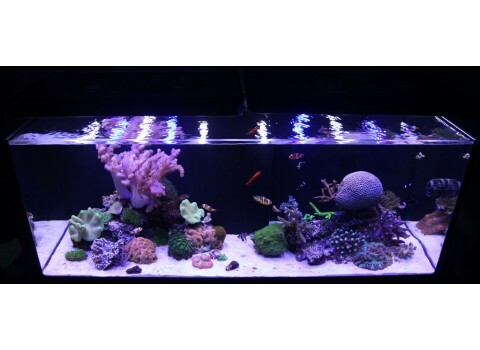 Quarantine is a great tool to the reef enthusiast who has the time/money/area to do it, but most of us find ourselves wanting to introduce corals into our systems fairly quickly. 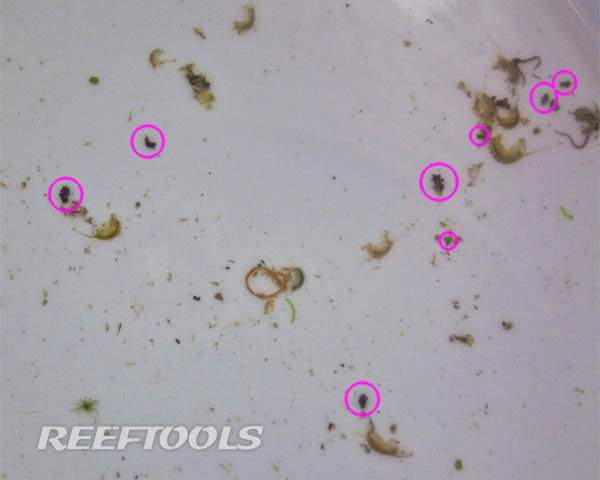 If you find yourself in a similar situation, dipping corals can definitely help alleviate some of the woes of unwanted pests into the aquarium. 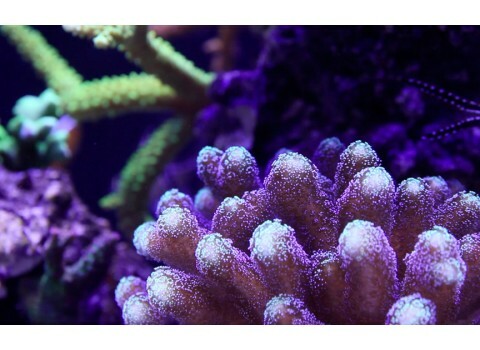 Another viable reason for dipping corals is when you see one or more of your corals not looking like they should/are stressed and there is no explanation due to tank levels, you may want to dip a coral. Please note: Some corals do not react well to certain dips. Make sure to search which dip is effective on the coral you plan on dipping. So you have your brand new coral or that coral you want to dip in mind. 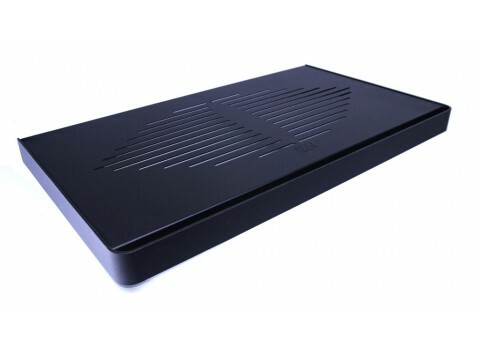 Let’s assume you have already temperature acclimated your coral using your method. 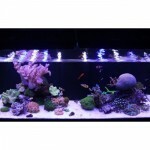 Some reefers prefer multiple dips to achieve the end result of de-pestifying your coral before going into the tank. 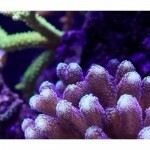 Keep in mind that certain corals stress more than others when dipped before moving on. Before dipping, ideally we should have a large enough container with premixed fresh salt water, kept at a stable temperature, prepped for the dip. If you go ahead and decide on multiple dips, then multiple containers are necessary. 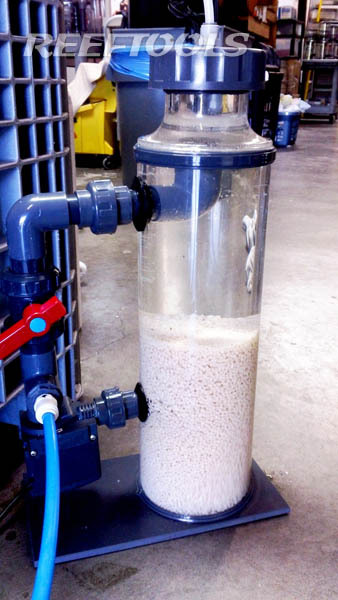 In addition to the dipping/dirty containers, another container containing fresh salt water with no additives should be kept to rinse the coral. Here is where we will go ahead and perform the dip. In this scenario let’s go with a 2 dip process. 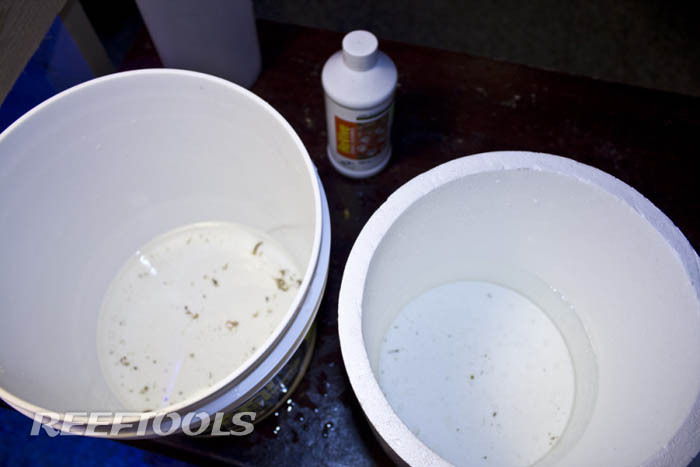 Since we have the 2 dips, we will prepare 3 containers of an adequate size for the coral/corals we are dipping. 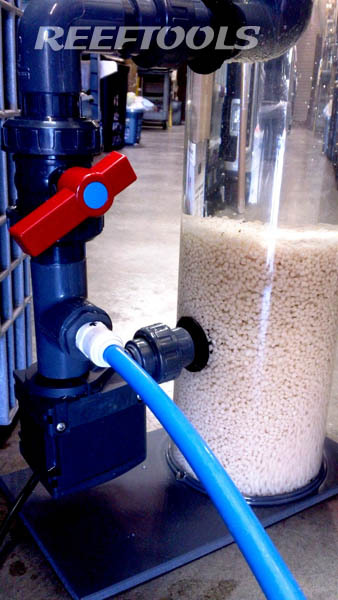 Each container contains the specified dosage per amount of water inside the container and kept at a decent temperature. Some reefers overdose with the dip chemicals and corals have no adverse effects, but tread carefully since corals will react differently. This is suggested only if you have had experience with the process and are confident that the coral will survive. 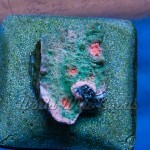 While the coral is in the container, wait for the set amount of time as directed. 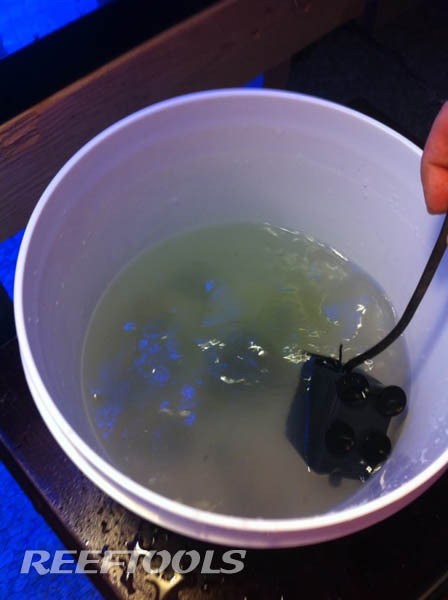 During this time, some aquarists use a small powerhead in the container to help move the water and blow off the pests which are dead or in shock. Others wait a certain allotted time and give it a good shake every once in a while (shake it more than twice and you’re playing with it), and in some cases a turkey baster can be used to blow on the surface to see it particles come off. After waiting the set time, the coral comes out and goes into the second dip where the same process is performed. Once your second dip is done, you are at your rinse stage. 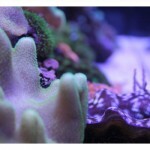 This step is the last step in the process before the corals going back into the tank. 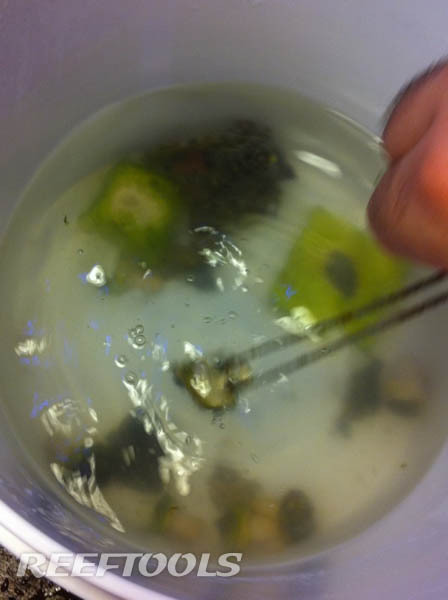 Placing the coral in the rinse container, and agitating the water/each coral is a great way to make sure all the baddies are off of the coral. 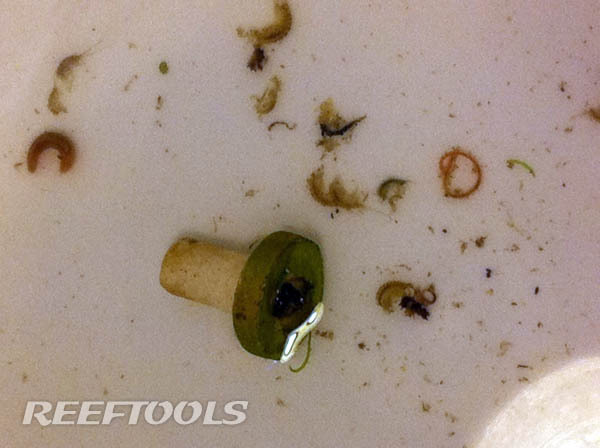 Then you can sit and admire all of the junk that comes off of your corals. At this point it just looks like a bunch of specs/micro fauna. 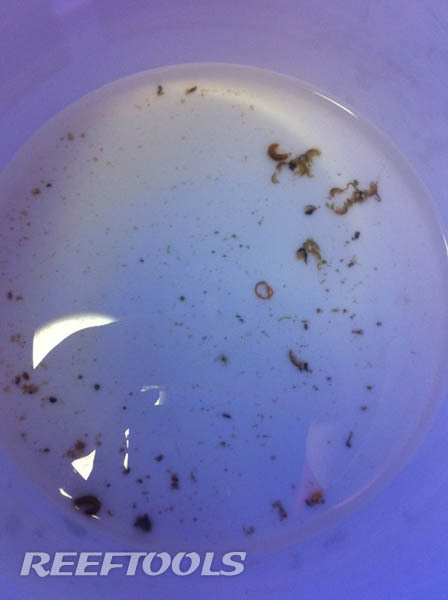 When taking a closer look, you can spot out the pests…. In this case, zoa eating nudibranchs. In this picture we have one dipping container and a rinse container. Even in the rinse container, bad/things keep coming off of the frags after a good shaking. That is it, it is a pretty straight forward process, but some newer reefers tend to overlook the process and wind up with a slew of pests. 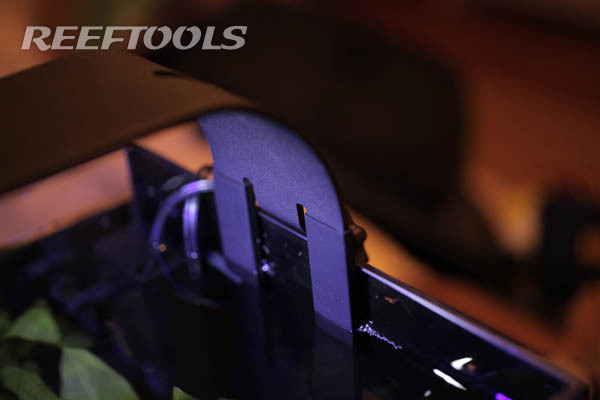 Spending a few minutes up front, can save hours of headache later. 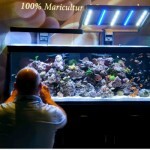 Hopefully your tank will be better off and your corals will be de-pestyfied. Go ahead and post what your dip process is, and what you dip. 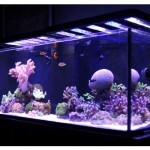 It will definitely help others in deciding what will help their corals. 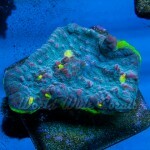 Check out the local thread in the forum for ongoing discussion about dipping corals. 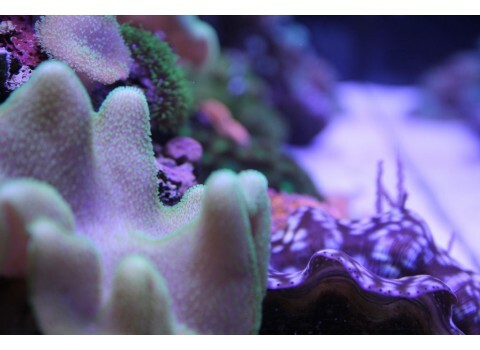 Happy reefing and stay pest free. 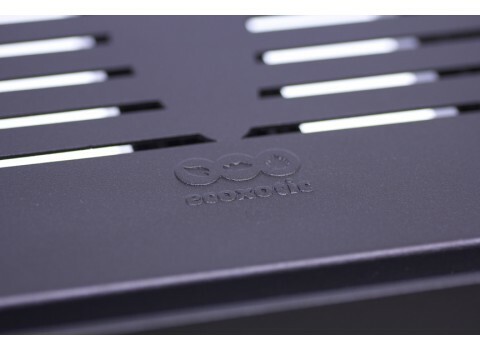 We recently got two EcoPicos from Ecoxotic, the basic version (EcoPico Desktop Aquarium) and the reef version (EcoPico Desktop Reef). 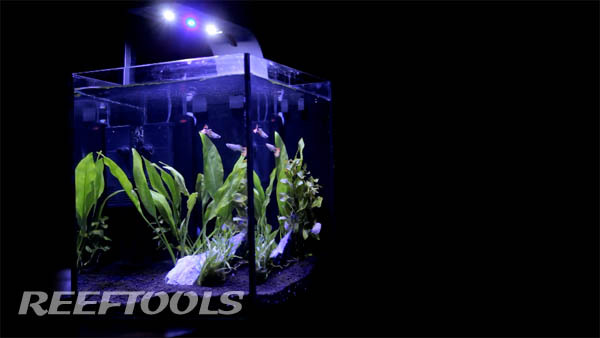 In part one, we will focus on a VERY basic initial freshwater setup of the EcoPIco Desktop Aquarium. We will document the transformation of this tank as it matures. In later parts, we will get to the reef setup as well (which is now cycling). 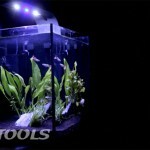 The EcoPico Desktop Aquarium is a 5.1 gallon tank, measuring 10″ x 10″ x 12″. 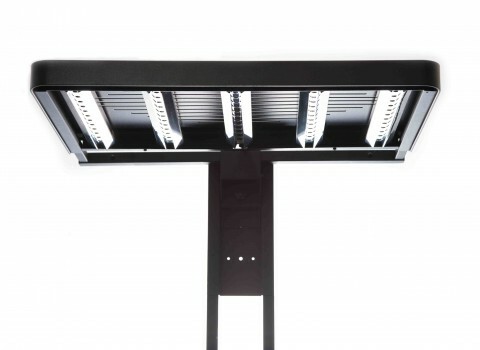 It comes with an aquarium filter & pump pushing out 80gph, and a very slick 9 Watts LED arm light with 2x12K white and 1x453nm actinic bulbs. 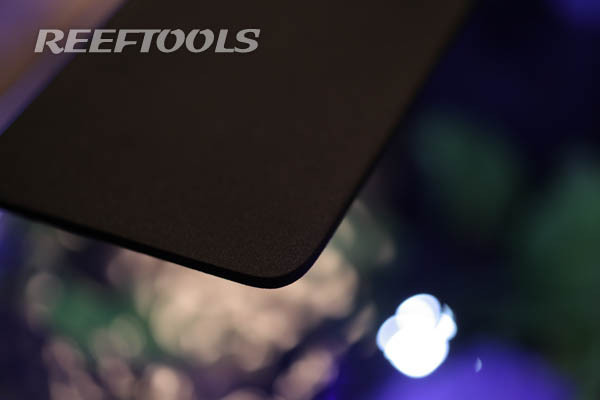 Our first impression was just how clean the setup is. 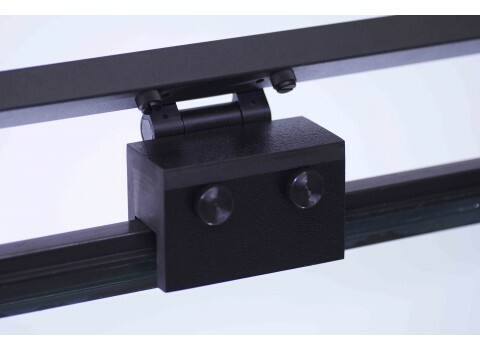 The rimless tank with black silicone looks great on the desktop and with only a few wires hanging off the back (light, filter, heater) we did not find it overbearing at all. 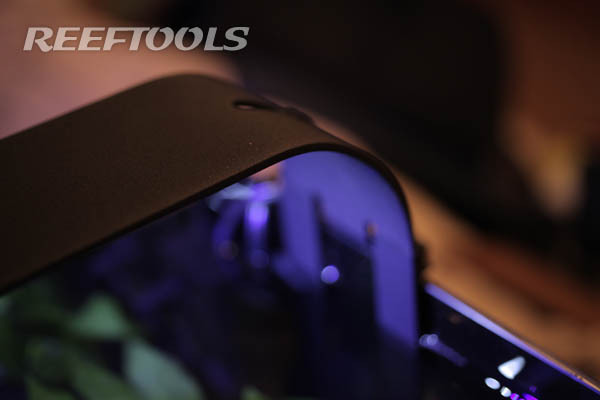 Our favorite part is definitively the EcoPico LED Arm Light. If you’ve only seen it online, you should definitely check it out. 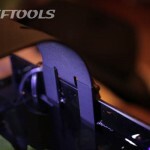 We included a quick video we shot. Please share it and tell us what you think. Don’t forget to subscribe to our YouTube Channel. Make sure to watch the video in HD!